Travelling changes your world and the world changes as you travel. 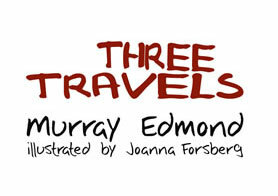 Three Travels consists of three poetic records - a bike ride into eastern Poland ("Narrow Roads to the East"), a trip to the Highlands of Scotland ("Ancestral Routes"), and a circumnavigation of the volcanic plateau of Te Ika a Maui/the North Island of Aotearoa/New Zealand ("Coming Round the Mountain"). The poetry that records these travels is loosely based on Japanese poem sequences, strings of haiku or tanka (with accompanying prose). But there is nothing rigidly "authentic" about the use of such forms: Michele Leggott christened these so-called haiku, "bike-ku," as they recall the mode of transport itself as much as the poetic form. Each sequence begins with a photo by Joanna Forsberg, and the whole book is designed to slip easily into a pocket for comfortable companionship as you travel. Murray Edmond and Joanna Forsberg have previously collaborated on The Fruits Of (Holloway Press, 2009), edition of 35, last copies available at $650. Three Travels is linotype set in12pt Helvetica Condensed by Longley Printing Co. and letterpress printed by Tara McLeod on a Littlejohn cylinder press. Images and cover are digitally printed by GTO Printers. Paper is 104gsm Sundance natural white. Size: 160 x 108mm, 40pp. Edition: 75 copies, signed. Price: $150. Three Travels was launched at the Gus Fisher Gallery, 74 Shortland Street, Auckland, on Friday 27 April, 2012 at 5.30pm. The speaker was Lisa Samuels.